WAREHAM, Mass. – Following an impressive victory on Friday afternoon, the Wareham Gatemen came back home for Game 2 of the Cape Cod Baseball League Championship Series in efforts to close out the season. With different objectives in mind, the resilient Yarmouth-Dennis Red Sox battled back for a 5-4 victory to even the series at one win apiece. The Sox will head back home to host Wareham for the deciding game on Sunday afternoon at 3 p.m.
More than 5000 fans watched the Championship game at Spillane. Luke Putkonen (North Carolina) took the mound for the Gatemen and was strong over five innings of work. After retiring the first nine batters he faced, Putkonen was touched first by Tyler Henley (Rice), who got to the Tar Heel first with a leadoff double in the fourth to begin the Y-D rally. Followed by an error and a fielder’s choice, Henley scored as the Red Sox struck with their first run of the game. Putkonen was able to get out of a jam in the fifth after putting two men on with one out, retiring the next two batters. Tim Mathews (Baylor) came in for relief in the sixth and didn’t hit trouble until the eighth inning. The Red Sox led off the eighth with a single and followed with another Gatemen defensive error, along with a passed ball that brought home the second Red Sox run. With a man on and one out, Henley delivered once again with an RBI triple. Luke Sommer (San Francisco) immediately followed with a two-run blast to right field, seemingly closing the doors on any potential comeback from the Gatemen. Luke Sommer # 15 mobbed by teammates after hitting a two run home run. 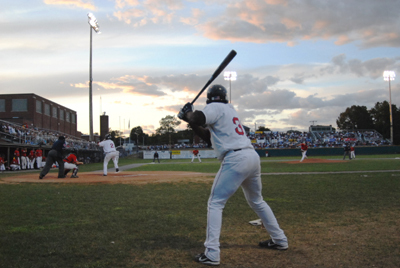 Fortunately for the 5,100 fans in attendance, the Gatemen made the game interesting despite being down 5-0. Joel Collins (South Alabama) led off the bottom half of the eighth with a double and Beamer Weems (Baylor) delivered with an RBI single of his own, putting the Gatemen on the board for the first time in the game. 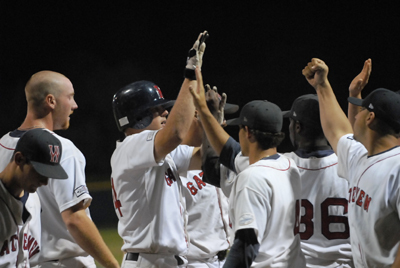 With no more damage done in the eighth, the Gatemen started the ninth with a single by Bradley Suttle (Texas). Luke Murton (Georgia Tech) came up to deliver an absolute shot of his own to the left field bleachers, bringing the Gatemen to within two runs. 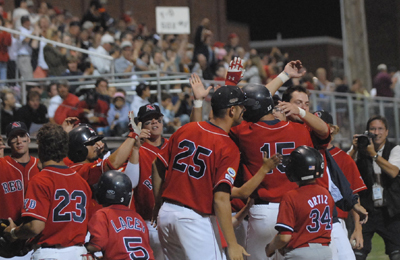 But after back-to-back strikeouts, the Red Sox were looking to close the door on any hopes for the Gatemen. With a pinch-hit appearance by Steffan Wilson (Harvard) to continue the rally with a double, followed by a wild pitch, the Gatemen brought the tying run to the plate with a man on third. Weems delivered again to bring the Gatemen to within one with a base hit. Luke Murton congratulated by his teammates after his two run home run. The Red Sox went to playoff stopper David Robertson to end any hopes for the home Gatemen fans to witness their first championship since 2002. With one on, Robertson struck out Ryan Gotcher (Arkansas-Little Rock) to end the game. After the disappointing loss, Gatemen GM John Wylde said, “I guess we’re just going to have to do this the hard way.” The two teams will battle it out for the CCBL title in the deciding game on Sunday afternoon at Red Wilson Field.